Dunmore Park, a castellated Tudor-Gothic mansion house was designed by William Wilkins and built in 1820-5 for George Murray 5th Earl of Dunmore (1762–1836). Dunmore Park was occupied by the Murray family until their departure in 1911 and remained as a private home until 1961. 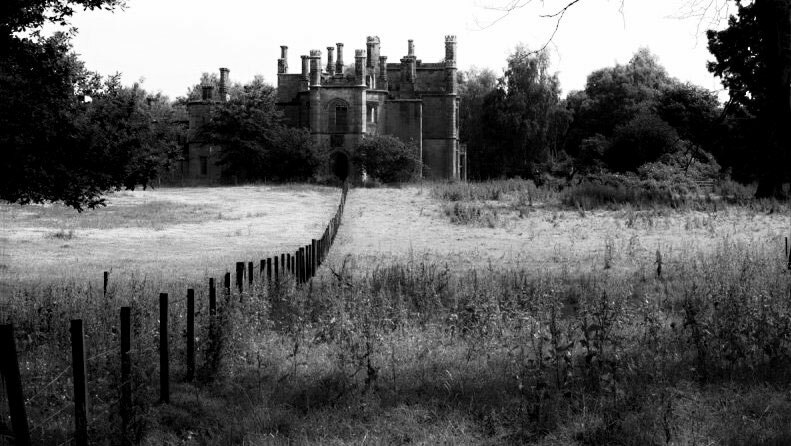 After a short spell as a girls school from then until 1964 it was abandoned. It was partly demolished and shorn of detail in 1972. The roofless shell remains to remind us of its grandeur and of our criminal neglect of our heritage. Dunmore was once famous across Scotland for its prize winning Shorthorn cattle. Dunmore Park was visited by Peter on the 11th January 2014. Peter started out at the 1761 Dunmore Pineapple and took the old approach to the roofless mansion. The drive is unmissable due to the guarding giant Sequioa trees, however the drive is now no more than a muddy farm track. Off this track, through much overgrowth lies the ruin of Elphinstone tower. It is now near collapse. The Elphinstone tower, which was converted in the early 1800s by Lady Elphinstone to become the family crypt actually dates to the early 16th century. It was built by Sir John Elphinstone as the seat of the barony of Elphinstone. The adjacent chapel, St Andrews, was demolished in the 1980’s and all that remains of this are scattered tombstones and steps amidst overgrown yews and rhoddies. The crypt has been broken into. The door, once guarded, open askew and the graves shockingly vandalised. As I entered the crypt my camera batteries gave up as if in sympathy with the dead Murray family. The crypts have been smashed open and the coffins ransacked. It is really most shocking. This is my film. Dunmore Park. I leave it to you to judge its effect. To judge its effect – Dunmore Park from omphalos on Vimeo. Love your page and video.. so sad. I want to win the lottery and restore it. Same here I hope one day it will be restored and never threatened again with demolition or vandalism. I am afraid I do not. I hope somebody may be able to help you with this request.